Archie Bishop was ordained on April 18, 1976. 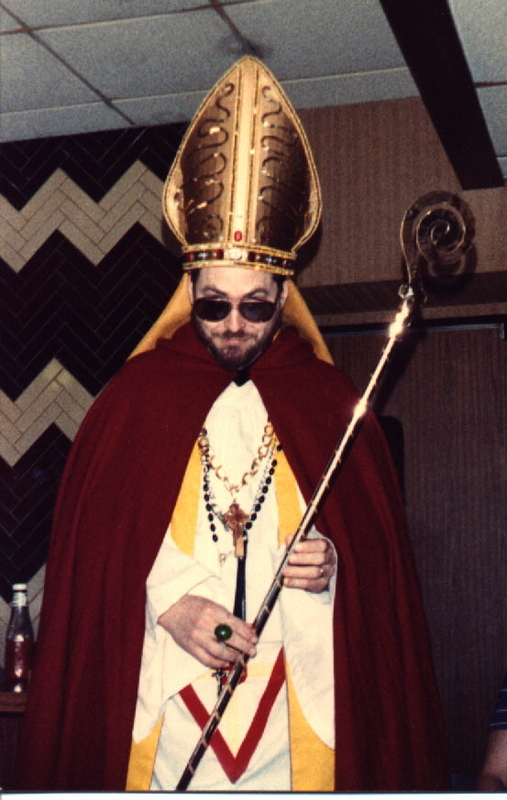 Ordained as Pope Pompous the Improbable, he founded the Archdiocese of Cyberspace in 1989 and was instrumental in the founding of CompuChurch International Headquarters. He was appointed Archbishop of Cyberspace in 1992. He is shown here in full Ecclesiastical Garb preceding the 1989 Celebration of Elvis Sunday. The Archbishop is the Supreme Ecclesiastic of The Church of Elvis, established in 1988. For complete details on the Church of Elvis, click on the link below. The Bish has blessed you times.